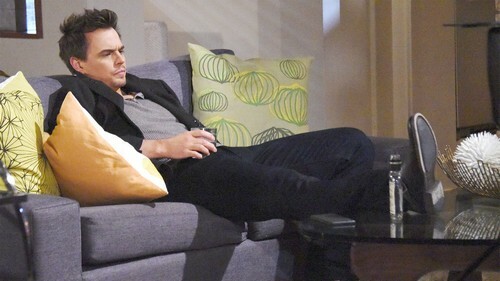 The Bold and the Beautiful (B&B) spoilers for Wednesday, March 21, tease that Wyatt (Darin Brooks) will be appalled by Detective Sanchez’s (Jeremy Ray Valdez) latest accusation. Sanchez has to look at all the suspects in Bill’s (Don Diamont) shooting and Wyatt is certainly one of them. He was dealing with plenty of rage before that gun was fired. Sanchez will once again push Wyatt to be honest about his actions. He’ll wonder if Wyatt has something to hide. Wyatt will insist that just isn’t the case. He’ll admit that he hasn’t been on good terms with Bill lately, but he won’t think that proves anything. Wyatt will shout that there’s no way he would ever shoot his father. Of course, Wyatt awakened with a severe hangover and could have a few memory gaps. Can he be absolutely sure he didn’t do the deed? It sounds like this B&B mystery will continue to heat up! Meanwhile, Brooke (Katherine Kelly Lang) will give Steffy (Jacqueline MacInnes Wood) some advice. She’ll feel like Liam (Scott Clifton) deserves to know about Bill’s recent proposal. Steffy won’t be certain that coming clean is the best idea. Liam already has a lot on his plate. Nevertheless, Brooke may talk Steffy into making a confession. It’s not like Steffy asked Bill to pop the question. Brooke may think Liam will understand that this is what Bill wanted, not Steffy. Unfortunately, Steffy doesn’t realize that Hope (Annike Noelle) just blabbed to Liam. Across town, The Bold and the Beautiful spoilers say Liam will still be in shock. He’ll want the details from Hope in Wednesday’s episode. Hope will be on the verge of tears as she explains what she heard from her mom. She’ll note that Steffy told Brooke the night Bill was shot. Liam will be hurt when he realizes Steffy kept quiet at the hospital. He’ll feel like this is something he needed to know right away. Steffy will be just as upset when she discovers Hope spilled the beans. She’ll fume over this stunning betrayal. Over with Ridge (Thorsten Kaye), he’ll have another major outburst. Ridge isn’t even trying to conceal how much he loathes Bill. By the end of the week, Ridge will hate his enemy even more! He’ll land behind bars after Bill accuses him of attempted murder. It sounds like some shocking moments are on the way. We’ll give you updates as other Bold and the Beautiful news comes in. 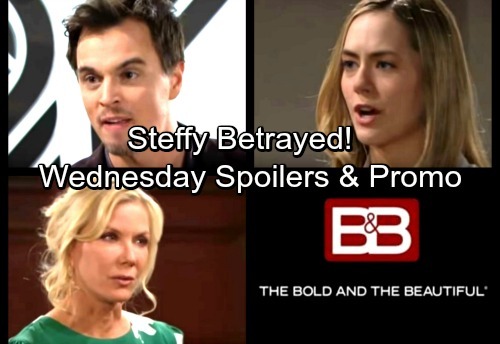 Stay tuned to B&B and don’t forget to check CDL often for the latest Bold and the Beautiful spoilers, updates and news.